This is a recipe I adapted from BBC Good food… which is something I do a lot. Find a recipe, and think… mmmm how can I make this healthier? It’s really easy to do, and you just need to experiment with your favourite recipes to make them better for you. This is a lovely light cake, sweetened with juicy apples which makes the sponge moist. 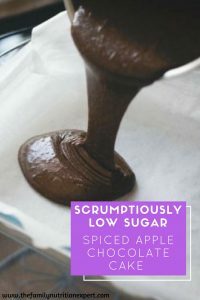 I have adapted the recipe to use less sugar, and I’ve included the whole apple, rather than peeling first, to keep all the wonderful pectin fibre just in and under the skin. 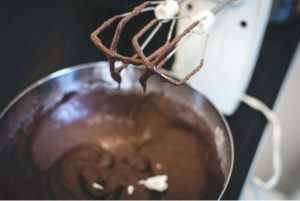 It’s a deliciously fresh recipe… and if you want to feel really indulgent just melt some dark chocolate with a bit of coconut oil or butter and drizzle it all over the top. It’s also really yummy served with some coconut cream, crème fraiche or thick Greek Yoghurt. Heat oven to 180C/160C fan/gas 4 and line a 23cm loose-bottomed cake tin with baking parchment. In a large bowl, beat together the eggs and sugar until thick and pale, about 5 mins. Pour in the oil and stir well to combine. Sieve in the dry ingredients and fold through until the mixture is smooth and well combined. 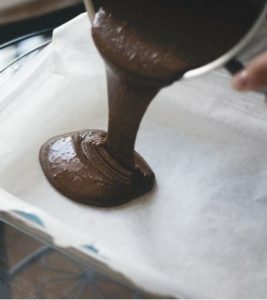 Carefully pour the mixture into the tin and bake for 45-50 mins. Leave to cool slightly before turning out onto a cooling rack. Once the cake is cool, dust lightly with icing sugar and cinnamon.